Cue the tastebuds happy dance! Heat a large pot over medium heat. Once hot, add oil, onion, cumin, and 1/4 tsp salt. Add garlic, ginger, cilantro, and green chilies to a mortar and pestle and grind into a rough paste (or use a small food processor to pulse into a paste. Alternatively, just finely mince.) Then, add to the pan with the onions. Next add ground coriander, chili powder, and turmeric and stir to coat. Add a little more oil at this point if the pan is looking dry. Next add pureed tomatoes and chickpeas and remaining 1/2 tsp salt. If the mixture looks a little too thick, add up to 1 cup water. Youâ€™re looking for a semi-thick soup consistency at this point, as it will cook down into more of a stew. Increase heat to medium high until it reaches a rolling simmer, then reduce heat to low or medium-low and maintain a simmer (uncovered) for 15-20 minutes, or until thick and stew-like. Stir occasionally. 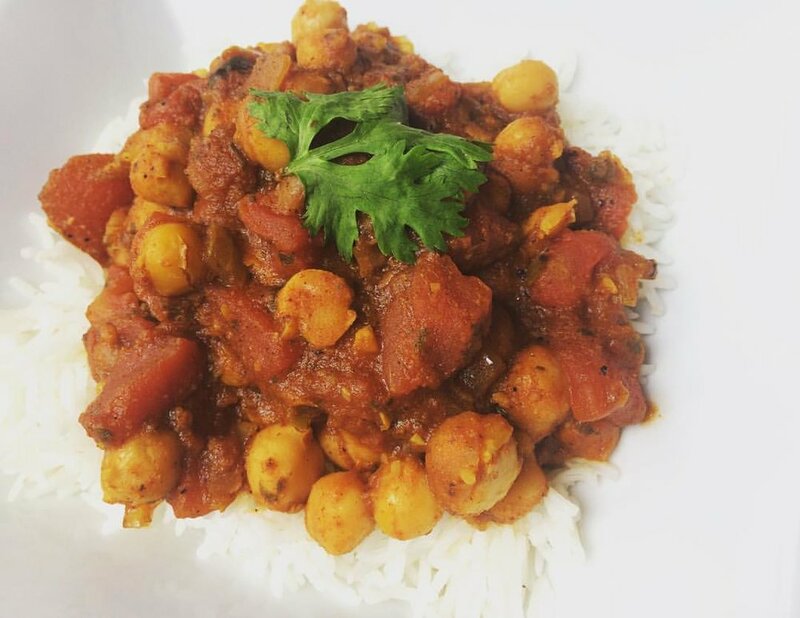 When the chana masala is thickened and bubbly, taste and adjust seasonings as needed, adding more salt for saltiness, chili powder for heat, or a bit of coconut sugar for sweetness and to offset the heat of the chilies. Remove from heat and add lemon juice and garam masala. Stir to mix, then let cool slightly before serving. Fresh cilantro and lemon juice make an excellent garnish. Leftovers will keep covered in the refrigerator up to 4 days, or in the freezer up to 1 month.